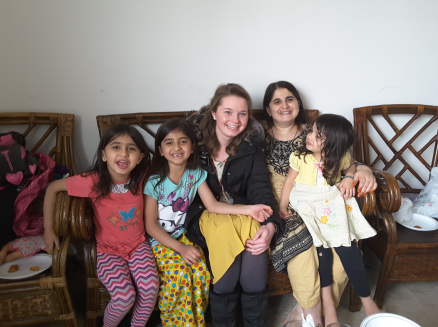 This week on exchanges we met a family from Pakistan! I love all people, but wow I really love people from Pakistan- they are so nice and make the best food! We told them we were missionaries but they immediately invited us in, sat us down, and asked if we would like juice. Even though they have different beliefs, the mother asked “Do you teach children or adults? How much do you charge?” And then busied herself in the kitchen, leaving us to teach her 3 adorable daughters about our beliefs, hahaha. We showed them the “Child of God” video and talked to them about how we are all children of a Heavenly Father who we lived with before this life. The young girls were a little mind boggled at first, but as soon as the video started they were all intently watching- the only quiet moment our whole visit. The spirit is so powerful guys!! The oldest little girl seemed to really hang on to that truth, and I hope it can stay with her the rest of her life.